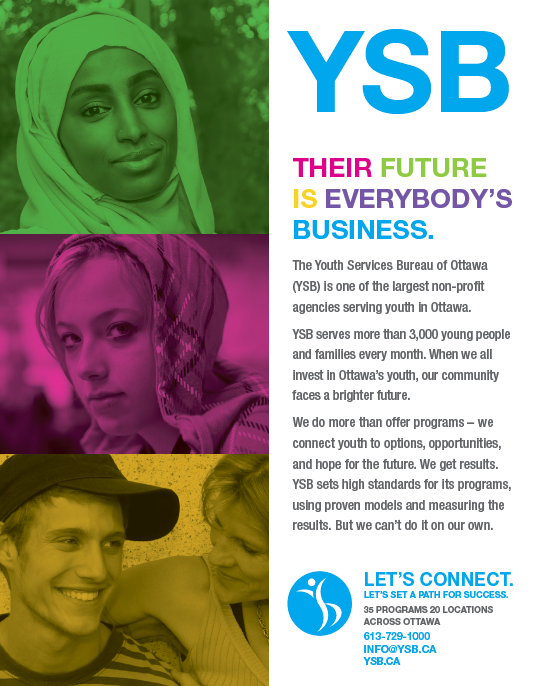 The Youth Services Bureau of Ottawa (YSB) is a multi-service agency providing life-changing programs and services to youth across Ottawa. Each month, we serve more than 3,000 young people and their families in the areas of housing, community services, mental health, employment, and youth justice. With the support of our community, we have helped change the lives of tens of thousands of young people so they may lead independent, healthy, and stable lives. The future of our community begins with our young people. Providing youth with support, resources, and opportunities ensures that they not only are able to meet their needs today, it means they are able to achieve their goals tomorrow. The support from our corporate partners means that YSB is able to provide critical services to youth that helps them meet their physical, emotional, and psychological needs. Our fundraising priorities are focused on two major challenges for youth in our community: affordable housing and mental health. We are raising funds to support vital services such as our emergency youth shelters, our Youth Mental Health Walk-In Clinic, our 24/7 Crisis Line, and our downtown Drop-In Centre, among others. YSB is also working with the community to build new supportive housing for at-risk and once-homeless youth in Ottawa. YSB’s downtown Drop-In Centre serves at-risk, homeless, and street involved youth 365 days a year. YSB offers individuals, corporations, and groups meaningful volunteer opportunities that help us continue to improve the lives of young people in Ottawa. Volunteer opportunities can include revitalization of our outdoor or indoor youth housing locations (gardening, painting, cleaning, organizing), event support, administration support, and more. Taking place on November 30, 2017 on the field of TD Place Stadium, community members will spend a night outside sleeping out to raise funds and awareness for youth homelessness programs offered by YSB. YSB’s SleepOUT for Youth event in 2016 at the Stadium at TD Place. The Moms for Mental Health event series invites specialists in the area of youth mental health to engage with parents and caregivers around the well-being of their children. The event raises both funds and awareness for youth mental health.